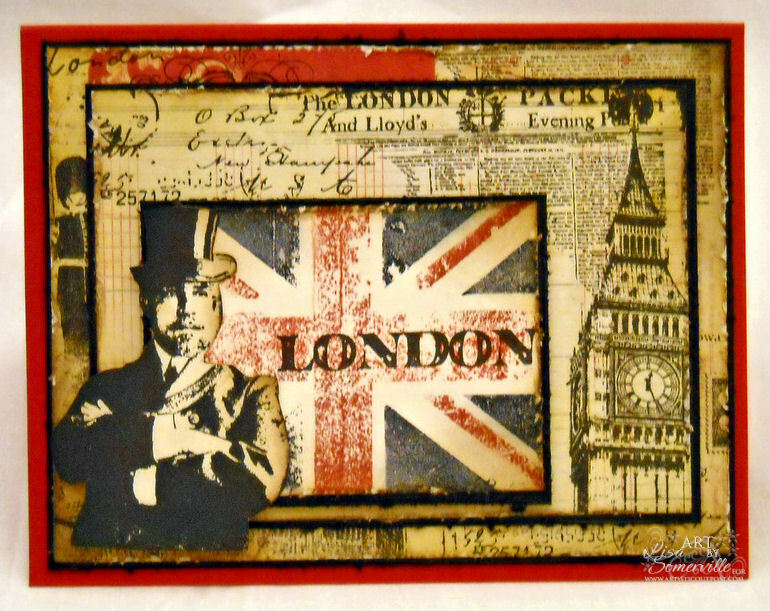 The 7 Gypsy papers are just perfect to use with the London Underground and Loverly London plates from Artistic Outpost. I randomly added images from the plates to the 7 Gypsy papers, inked and stamped the flag with distress ink and added London to the center. The fab gentleman is stamped in Black Archival, cut out and distressed then added to the collage. Other - Distress Tool, Ink Blending Tool, Craft Mat, SAMJ, 7 Gypsy Paper. Carry on, I do say the ol' chap looks marvy on your collage, just loverly! You do such beautiful work, Lisa! This is great! Outstanding collage and so beautifully layered! Those papers are perfect for those stamps, which are becoming very hard to resist! Have a great Saturday! love those papers and they work so well on with those images. I love the way this all came together! Love the papers, colors and the collage, great card. Loverly card! The layering is perfect and the colors pop!